The ladies that like Batman and really short shorts are in luck. 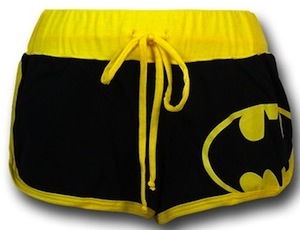 These short shorts also called booty shorts are black with a lot of yellow accents and have the Batman logo on the front and the word Batman on the back. With crazzy hot summers what better to wear then these Batman shorts for women. These short shorts come in a range of sizes and are made from 50% cotton and 50% polyester. If Batman is your superhero then come and check out these Batman Ladies Booty Shorts. When the days get warm we all want to wear something lighter and cool. Now we found something sweet. Cotton Strawberry Shortcake shorts. These shorts are nicea and red with a pink edge. 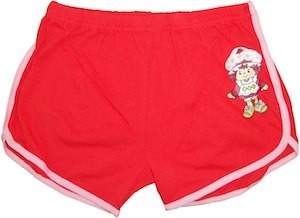 On the front of the shorts it has a picture of Strawberry Shortcake and on the back it says in BIG strawberry covered letters “Sweet thing”. These shorts come in sizes small to x large and will be great for the warm days to come. Come have a better look at the front and back of these Strawberry Shortcake Shorts. Does your boyfriend like Batman? If so why not surprise him by wearing these cute Batman shorts for girls? The shorts have the bat logo on the front and the word BATMAN on the but. Check out the other pictures of the Batman Booty Shorts.